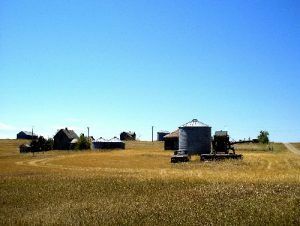 Silent buildings stand on the prairie in Okaton, South Dakota, July 2006, Kathy Weiser. Click for prints & products. 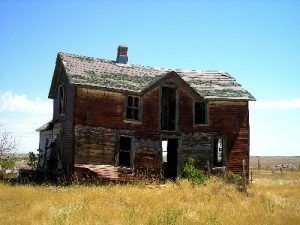 Overlooking the rolling plains of South Dakota is the ghost town of Okaton. Though the 2010 census states the town is still inhabited by 36 people, the vast majority must live on nearby farms, as most of the remaining buildings are crumbling, and the only sign of life is at the old general store and the tiny little post office. Okaton’s days as a thriving railroad and farming community are long past. Established along the Chicago, Milwaukee & St. Paul Railroad, as it pushed westward towards Rapid City in the early 1900s, the town housed many of the railroad men as well as a number of hardy homesteaders. It soon sprouted a number of businesses, all but one of which, are gone today. As the building of railroad moved westward, the many railroad workers followed, already leaving the community just shortly after its founding. Though many of the homesteaders hung on, raising cattle and planting the fields with various grains, many of them, too, began to leave as they faced the harsh reality of the vicious winters. During the depression, this was especially true, when numerous residents left the farms in search of jobs in the cities. When the railroad pulled out in the mid-1980s and the town was bypassed by I-90, it spelled certain death for what little was left of the town. The general store today. You can see where “Westlake’s” has been painted over. July, 2006, Kathy Weiser. However, it was during this decade that Robert and Evelyn Westlake, who had no roots in the area, moved from Illinois to Okaton, bought some property and tried to turn the small town into somewhat of a tourist destination, placing numerous signs on nearby I-90 advertising “Westlake’s Ghost Town!” At that time, their “tourist destination” included a well-stocked rock shop, gas pumps, and a “general store” that served up drinks and sandwiches. The Westlakes also built a “ghost town façade” at the side of their store and provided a petting zoo for visitors. Their signage obviously worked, as the people began to detour off of the highway to visit the small town. Today, the Westlakes have passed on, their holdings have been sold, the signs are gone and the “ghost town façade” is no longer open for visitors. The “general store” still stands, though with very little variety, fewer rocks, and not nearly as much ambiance as it did in the past. However, this little ghost town is well worth the exit, for views of its numerous crumbling buildings and photo opportunities, not to mention, a serious nostalgic flavor that seems to waft in the air and transport you back to another time. The large, abandoned grain elevator still stands near the old railroad tracks, displaying the words Bingo Grain Co. 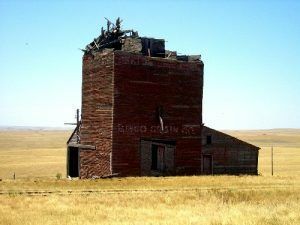 This building was actually the elevator for the Okaton Grain Co.; however, at one time, a movie was filmed here, and the producers painted the name of the “Bingo Grain Co.” on its side. Though the building still bears the false name, the movie was never released. 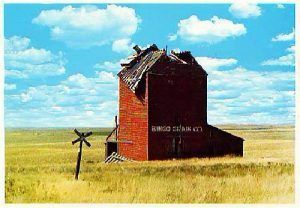 The Okaton Grain Elevator, July, 2006, Kathy Weiser. This photo was made into a postcard in 1984. Though the paint has faded and the railroad crossing sign is gone, the old storage building has held up quite well. Photo by George A. Wright. According to an old postcard we picked up, this was Crazy Bear’s house, July 2006, Kathy Weiser. 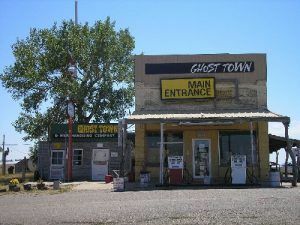 The general store and rock shop, complete with gas pumps, and its “ghost town façade” is just across the road. Elsewhere in the small town, visitors will find a number of old homes, a school, tumbling shacks and grain storage buildings, rusting farm equipment, and rickety fences. Please be aware that all of the buildings in this town are privately owned, not part of any type of “attraction,” and many are still utilized by current residents for various purposes. Yes! — Even those that are crumbling. Please do not venture off the public roads onto these properties to explore their interiors, to get a better picture, or get a closer look. Okaton is just south of I-90, at Exit 183 in south-central South Dakota. © Kathy Weiser/Legends of America, updated April 2017. 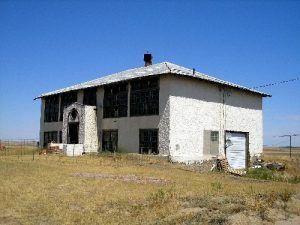 The old Okaton School, July, 2006, Kathy Weiser.